Revellers at this year's Glastonbury Festival are in for another wet and muddy year, forecasters have warned. Rain is expected before and during the legendary music event, Met Office forecaster Stewart Wortley predicted. "Given that we've got a wet week, I think it's going to be the normal quagmire," he told the BBC. But festival founder Michael Eavis has improved drainage since the floods at the last event in 2005 and said they were used to "the occasional shower". His Somerset farmland opens its gates to campers on Wednesday, with the music running from Friday to Sunday. Two years ago, more than 400 tents were submerged after a storm hit the Somerset site on the festival's opening day. A month's rain fell in less than two hours. "We've probably spent £100,000 on the drainage and the flood relief stuff and everything," Mr Eavis told the BBC News website. "We've got huge concrete pipes that will take the water from A to B and take it to the river and then it goes to Burnham-on-Sea, so it's a great system. "So we're almost looking forward to the rain, in order to see the pipes working after all this investment." He has also promised more covered stages. This year, general showers are expected, rather than the intense downpours of two years ago. The Met Office's Mr Wortley said it would be "quite wet" when the bands kick off on Friday. "It will be cloudy with rain turning showery later in the day," he said. "Some of the showers could be heavy." Much of Saturday would be cooler and cloudy with light rain, moderate at times", he forecast. "Sunday might start with a little bit of sun but showers developing, and then more general rain at the end of the day. 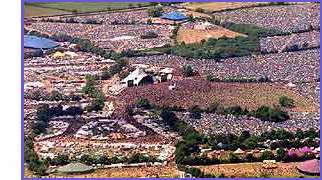 So typical Glastonbury I think." The Arctic Monkeys, The Killers and The Who will headline the event. Festival-goers will be given the option of leaving their wet tents behind so they can be dried out and reused in impoverished countries. The Give Me Shelter project, launched by charity Global Hand, hopes more than 1,000 people will leave their camping equipment for countries such as Botswana and Sri Lanka. Glastonbury Festival director Melvin Benn said the environmental impact of tents being left behind was "immense", adding that it could be used to help other parts of the world. When i left this morning when cars were getting stuck in the mud tractors were getting behind them and shoving them away. Now this is good but they had no tires onthem or anything protective and its totally wrecked my bumper!! Its smashed to bits and didnt relise until i got back to Newcastle, good thing i wasnt in a accident. Has anyone else had this happen to them???? It did actually, in my layman's opinion. I mean, I'm no engineer, but the drainage was much improved. No site with that many people could withstand the onslaught of the weather.